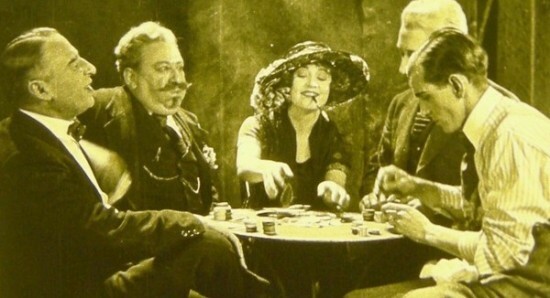 The New Zealand Film Archive and the National Film Preservation Foundation (NFPF) announced this week that they had discovered the first 30 minutes of The White Shadow, a 1923 silent film considered to be the first credit by Alfred Hitchcock. Although Hitchcock did not direct the movie — Graham Curtis did — the now-legendary filmmaker, then 24, served as assistant director, editor, and production designer. The British melodrama follows twin sisters — one evil, one good — both played by Betty Compson, and co-stars Clive Brook. Read more details, including information on its American “re-premiere,” after the jump. The LA Times reports that film was recently rediscovered when the NFPF received a grant from the Andrew W. Mellon Foundation, allowing an archivist to sort through American films within the New Zealand archive’s collection of nitrate prints. The White Shadow had been brought there in 1989 by Tony Osborne, grandson of New Zealand projectionist and collector Jack Murtagh, as part of a cache of other unidentified American nitrate materials — a bundle that also eventually yielded John Ford’s 1927 picture Upstream. However, since the archive only had funding to restore the domestic films within its possession, the print lingered there unnoticed until this year. Leslie Lewis, a nitrate expert with the NFPF, was the one who went through the material and figured out what the reels labeled “Twin Sisters” really were. After taking a closer look at the footage and engaging in further research, Lewis came to realize that those reels were, in fact, White Shadow. She discovered three reels in all, totaling 30 minutes. He was a creative young man who had already done some writing. We know the kind of creative personality he had when he was young and we know a few years later he started directing movies himself. What we don’t know is how these things were coalescing in his imagination. The White Shadow has been sent back to the U.S., where it will “re-premiere” September 22 at the Samuel Goldwyn Theater. It will then be added to the Academy of Motion Pictures Arts and Sciences’ Hitchcock archive, which also includes the director’s letters.